Customizing your own BigCommerce website could be quite a tricky thing. If it’s your first time of setting the website, many technical things might seem to be really complicated. One of the points that may make you feel confused is providing other people with access to your website. Having your own website you definitely desire to make it the most informative, convenient in using and attractive. One day you may realize that you cannot run the site alone and the team with new members is formed. Or there may be difficulties with apps installing or customization and unfortunately, issues may come up as well. In all the cases, you may need to share the access to your dashboard. 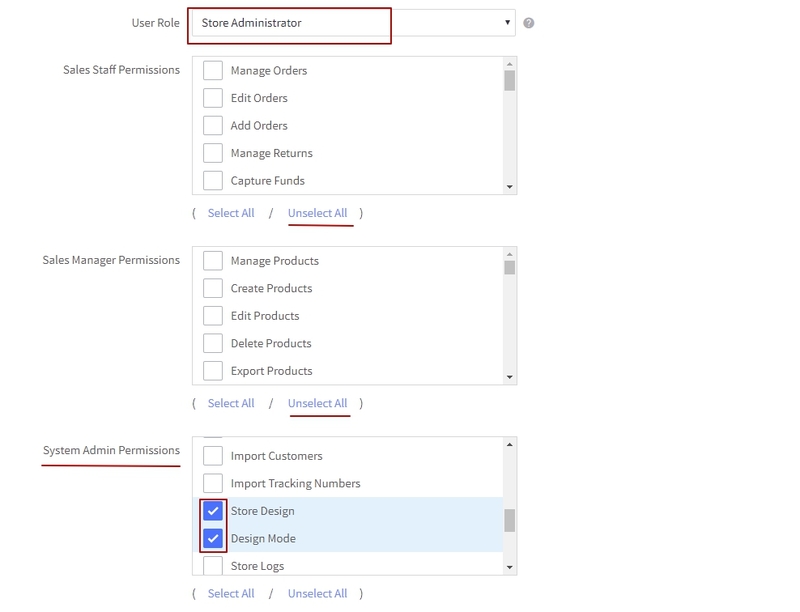 There are several kinds of user roles on the BigCommerce platform with different permissions. Sales Staff — permissions generally assigned to the person(s) responsible for the sales and/or marketing of your store. Sales Manager — permissions generally assigned to the staff member(s) responsible for processing orders. System Admin — administrator role with all permissions enabled. Store Owner — the person financially responsible for the account. Only the Store Owner can install, uninstall, or review apps and view support cases. There is only one Store Owner per store. Custom — a user-created combination of any of the Sales Staff, Sales Manager and System Admin permissions. Permissions for custom user roles can be selected one at a time, or another built-in user role may be selected and edited. Login as the site’s owner. Select “Users” and press “Create a User Account”. You will be redirected to the new window. The email you need is info@elfsight.com , select Store Administrator as a User role. In the System Admin Permissions window we need only two permissions – Store design and Design mode. We don’t need other permissions so you may press “Unselect All” in the rest of the windows. Now you may press “Save” button. We will get an email message with the link to follow to become your website’s editor. If the access is no longer required, you can cancel the access by deleting the email as your website’s editor. Go to Account Settings and press Users. Select the email you need and press the bin icon. Confirm the editor deleting in the dialog window and it’s done! It may be kind of a scary thing to give the access to people you even don’t know and we can see the point. Anyhow, by providing admin permissions you do provide access to some particular information on your website. As app developers, we know that sometimes it’s just impossible to provide a solution remotely. We need to have a go at your website and see what’s going on to provide the most effective help. So in case you’re asked to provide us Store Administrator access to your website it might be the only way to have an issue fixed, and you don’t need to worry about the safety of your information.